Does Sudden Sinkhole Portend a Nuclear-sized Explosion? 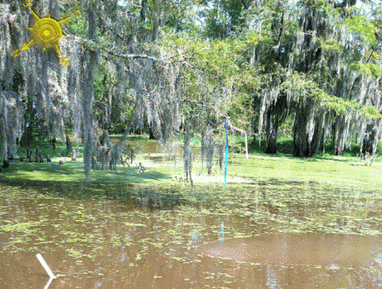 For many weeks, Corne and Grand Bayou residents warily noticed strange bubblings from the watery depths, and they reported smelling burnt diesel fuel and sulfur. Then overnight, a sinkhole the size of three football fields appeared, swallowing scores of 100-foot tall cypress trees. The beginning of a Grade B monster flick? No: real life in Assumption Parish, Louisiana. The 372-foot diameter, 422-foot deep sinkhole is just 1200 feet from Highway 70. Quantities of diesel and oil appeared on the surface of the slurry, creating a stink. 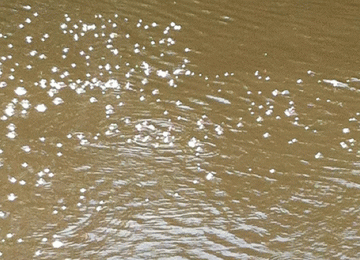 The mysterious bubbles in the bayou continue. 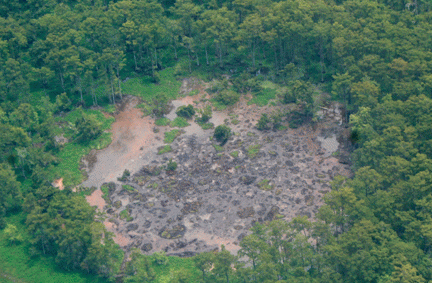 A butane-filled well is located just 1500 feet from the sinkhole. A breach could trigger an explosion. Scientists in an Examiner investigation, estimate that an explosion like this could be in the range of one-and-a-half B83 thermonuclear (hydrogen) bombs. The Department of Natural Resources issued a Declaration of Emergency on Aug 6. Daily briefings were held, 150 families were evacuated. Acadian Ambulance Services have been staged at the site for emergency purposes. During cleanup operations on the morning of Aug. 16, an additional 50' feet of property on the southwest side of the site suddenly fell into the sinkhole. 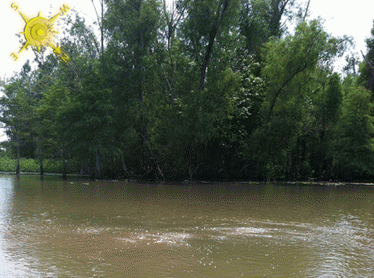 Two cleanup workers in a boat, which was tied to a tree in that area, were rescued via airboat. Shortly thereafter, their boat sunk into the sinkhole, pulled down by the descent of the tree it was tied to. All workers have been accounted for and no injuries have been reported. However, clean up operations at the site have been suspended. I interviewed Wilma Subra, a scientist and Pres. of the Subra Company, and past Vice-Chair of the Environmental Protection Agency National Advisory Council for Environmental Policy and Technology (NACEPT). Her company provides technical assistance to citizens concerned with environmental issues, by combining technical research and evaluation. Ms. Subra explained that the Napoleonville Salt Dome area, in which the sinkhole is located, is about 3 miles long and a mile wide. A salt dome is a naturally occurring formation of hard mineral. 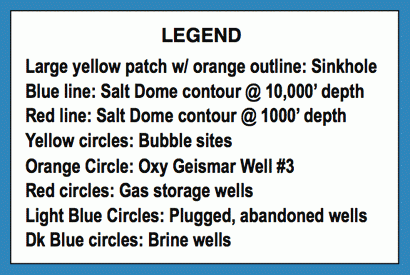 Some portions of a salt dome are used for solution mining in which a well is excavated, leading to a cavern below. Then, water is pumped in, and the resulting salt water is pumped out, creating brine, a salable product used in various manufacturing processes. Some caverns may be used for storing natural gas or butane. Subra said that on Aug. 3, something caved in somewhere, creating the sinkhole. It is not possible to determine exactly what happened until investigation by drilling.